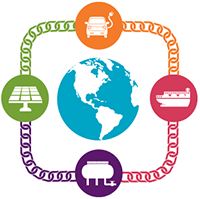 Come out and say hello to Blockchain Energizer co-author Buck Endemann as he presents on blockchain and renewable fuel standard, RINs, and biodiesel issues at the Oil Price Information Service (OPIS) conference in Chicago on October 1–3, 2018! EDF Energy, UK Power Reserve, and Electron Complete the First Blockchain-based Capacity Market Trade in the United Kingdom. Grant County PUD Raises Rates on Cryptocurrency Miners; Chelan County PUD Considers Doing the Same. Accenture and SAP Collaborate to Design a Cloud-based Blockchain Solution for Upstream Oil and Gas Operations. To view more information on theses topics in Volume 36 of the Blockchain Energizer, click here.